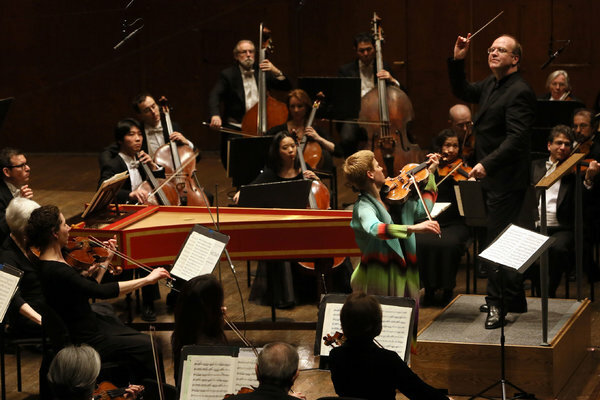 New York Philharmonic – More Bach! The month of March has featured The Bach Variations: A Philharmonic Festival at Avery Fisher Hall at Lincoln Center. Last week, I had the pleasure to hear the reduced forces of the Philharmonic present Bach’s Mass in B Minor. This week, the performance, again with reduced forces, included two Bach Suites, two violin concerti and an overture to one of Bach’s cantatas. The featured soloist was violinist Isabelle Faust playing the concertos BWV 1042 and BWV 1041. The concert was bookended by the 3rd and 4th orchestral suites. The conductor for the evening was Bernard Labadie. Labadie is a very animated conductor and fun to watch. He clearly has a passion for the Baroque which was most evident to me in the shaping of lines. Typically, Bach’s music can come off as dry and mechanical. There were line shapings here that were fresh and welcomed. Also of particular note was the endings of movements. They just seemed to float away into the air. Very musical and satisfying. Interesting review in the New York Times.